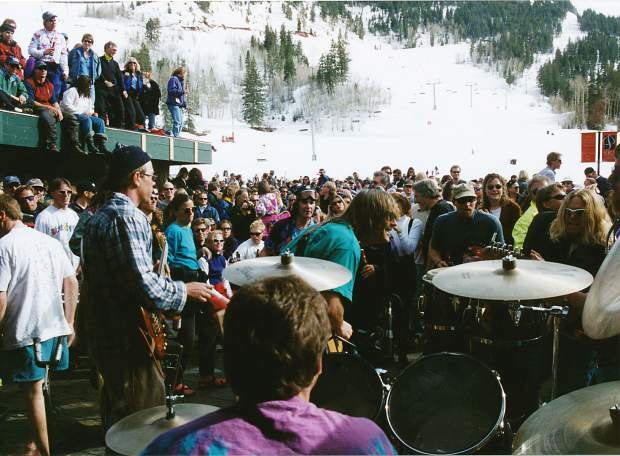 A legendary closing day rager at the at the base of Aspen Highlandson April 5, 1998. The bar's building was torn down the next day. 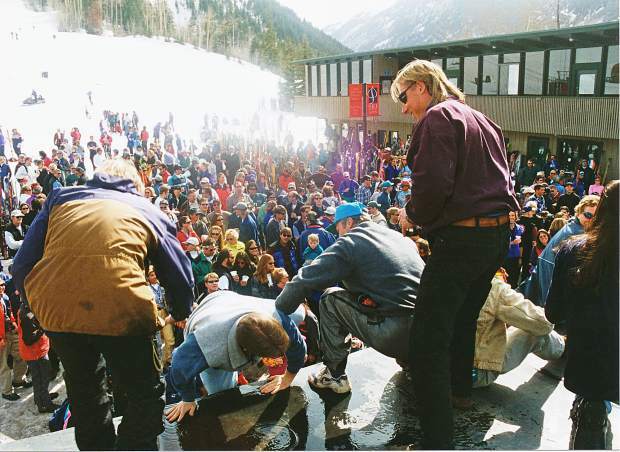 A legendary closing day rager at the base of Aspen Highlands on April 5, 1998. People were partying on the roof of the bar, which was demolished the following day. 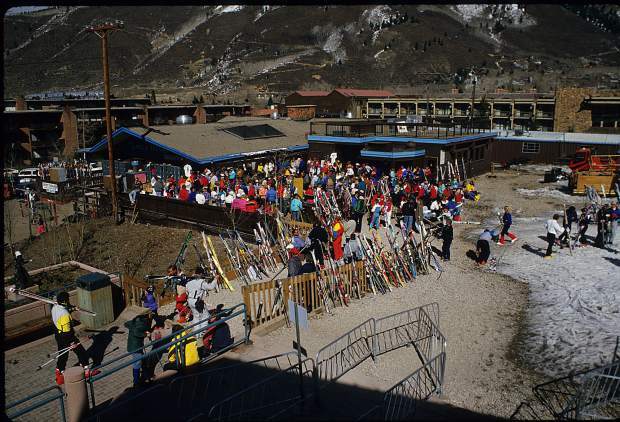 A crowd at the base of Aspen Mountain on its closing day in April of 1988. Construction of The Little Nell began after that ski season . 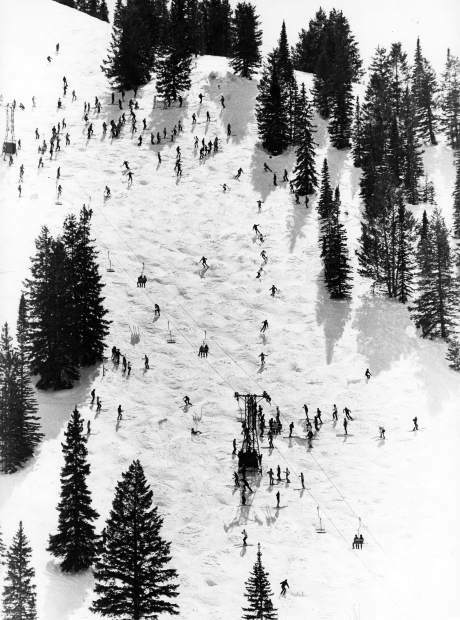 Skiers participate in the annual "Buckoff" on the Ridge of Bell Mountain at the end of the 1983 ski season. 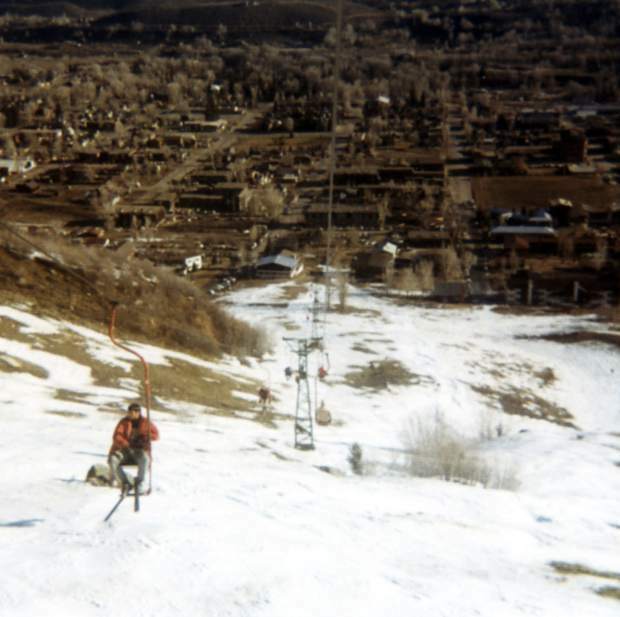 The former Lift One, the "Fifth Avenue" ski run and a relatively undeveloped Aspen pictured on the mountain's closing day, April 11, 1971, which also happened to be Easter Sunday. 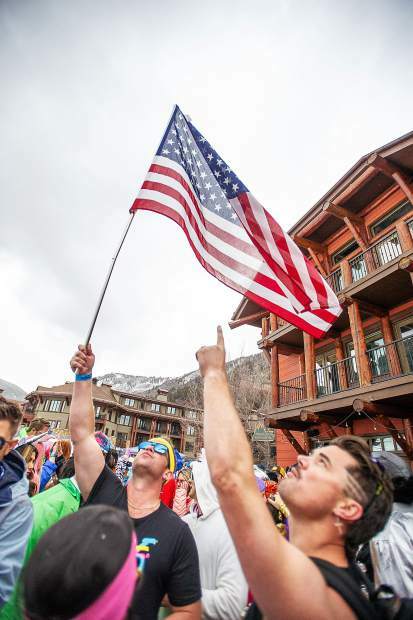 This also marked the last day for Lift One, which was replaced by Lift 1 A.
Partiers on Aspen Mountain for Bonnie's Bash. Bacon and closing day at Buttermilk. Damian Quigley in snowblades for Highlands closing at the Merry-go-round. 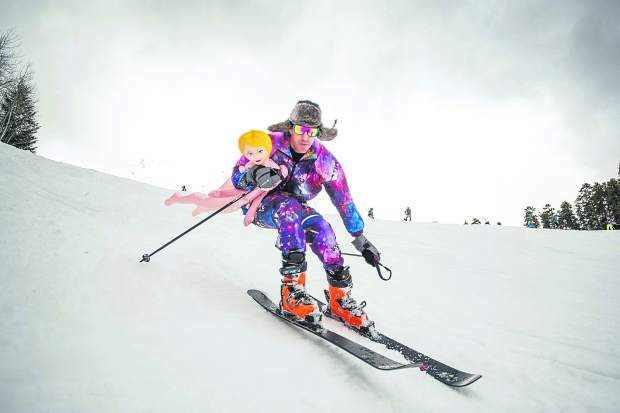 A skier carries a blow up doll down Aspen Highlands for closing day. The Aspen Highlands closing day party at the base. 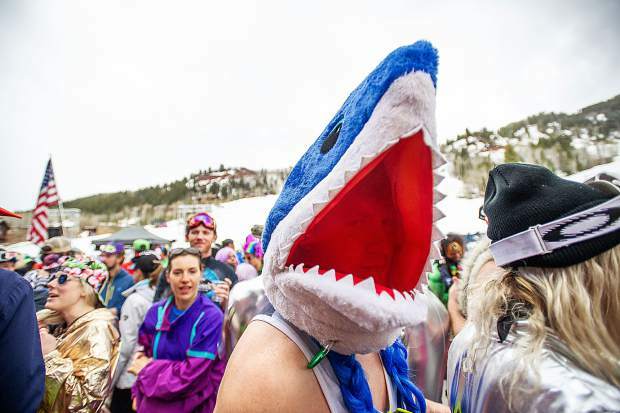 A participant of the swimsuit ski down at Snowmass for closing day. The party at the base of Aspen Highlands for closing day. 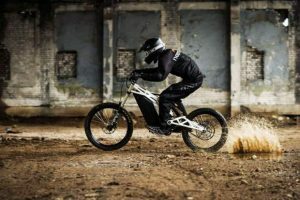 While Aspen Highlands is certainly the big one, in recent years Aspen Skiing Co. and Snowmass Tourism have ramped up their end-of-season programming at Aspen Mountain and Snowmass Ski Area. 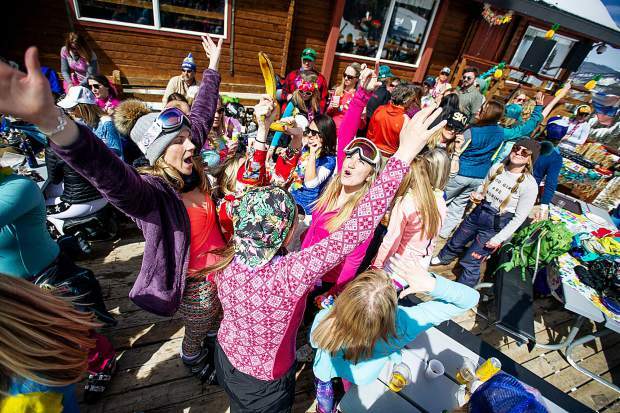 Elk Camp, 11:30 a.m. to 3:30 p.m.
Elk Camp restaurant will host its third annual end-of-season dance party complete with leis, margarita blender bikes, Goslings Rum specials a pond skim. Skiers and snowboarders are encouraged to participate in the pond skim and wear swim attire. 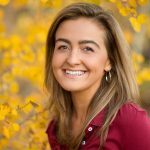 For those who don’t ski or snowboard, foot passes to Elk Camp are free. The third annual “swimsuit ski-down” from Elk Camp restaurant to Base Village will commence at 3:30 p.m.
Gwyn’s High Alpine, 12 to 4 p.m.
A “Top Gun” themed party featuring games, drink specials and DJ Berkel Beats spinning on the deck will take place at Gwyn’s High Alpine. Aviators, 80s denim and leather jackets are encouraged, as prizes will be awarded to the most outrageous Top Gun costumes. 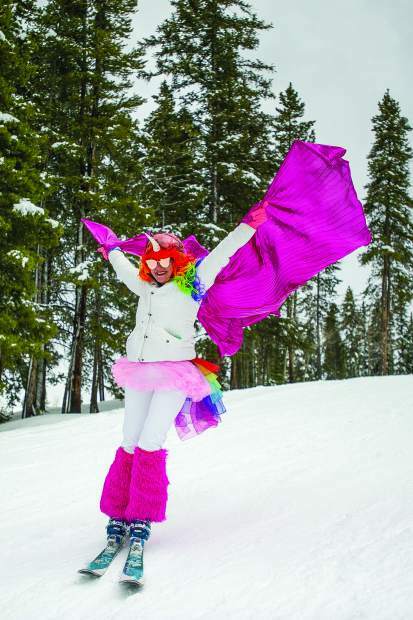 Base Village, 2 to 8 p.m.
Snowmass will close the season with an extravaganza in the Base Village gondola plaza. There will be hot tubs and a DJ playing 80s hits, as well as costume contests, a corn hole competition, bounce houses, a pig cook off and other food vendors. Participating restaurants include Base Camp Bar & Grill, Sake, Slice of Italy and State 38. Proceeds from the food vendors benefit Challenge Aspen. 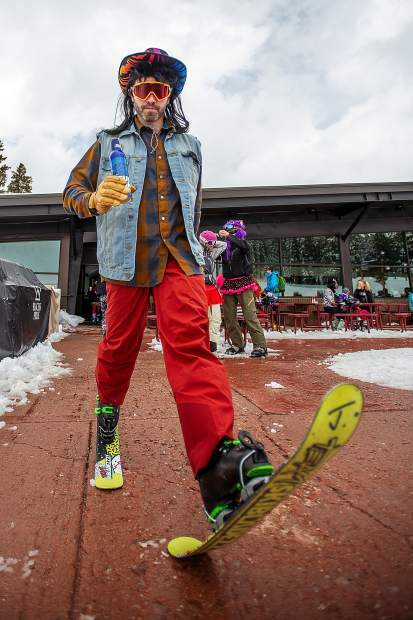 A number of restaurants in Snowmass Village also will offer live music and food and drink specials throughout the resort’s closing weekend. 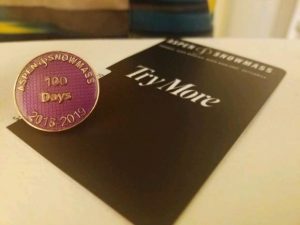 Visit gosnowmass.com for more. The Sundeck, 11 a.m. to 4 p.m. The 80’s theme will continue at Aspen with a prom party at the Sundeck. DJ Dylan will spin tracks at the party, which again will offer up Goslings Rum drink specials. Prom attire is encouraged and a king and queen will be crowned. Ajax Tavern, 2 to 6 p.m. The final hurrah at Ajax Tavern will offer “street-food inspired bites,” drink specials and a DJ. 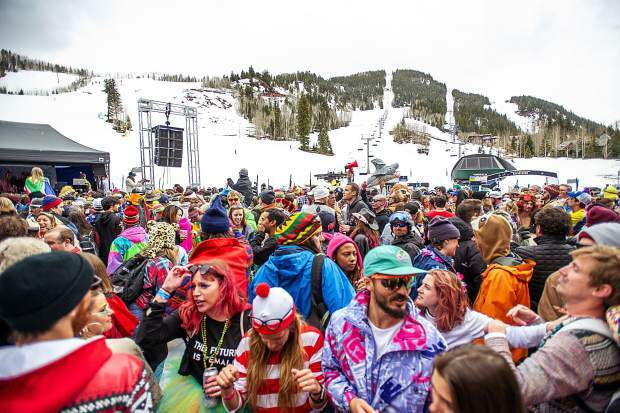 A rowdy contingent of locals swigged spirits, sparked joints and consumed questionable substances while grooving on the roof of the bar at the Aspen Highlands base to a 25-piece band — a local après-ski supergroup — on closing day 1998. The more disorderly of the bunch flung chairs through the glass windows of the bar; others ripped signs and memorabilia off the walls. “It was the closing day to end all closing days,” Travis McCraw, then a bartender at the Highlands Café, said of the 1998 celebration. 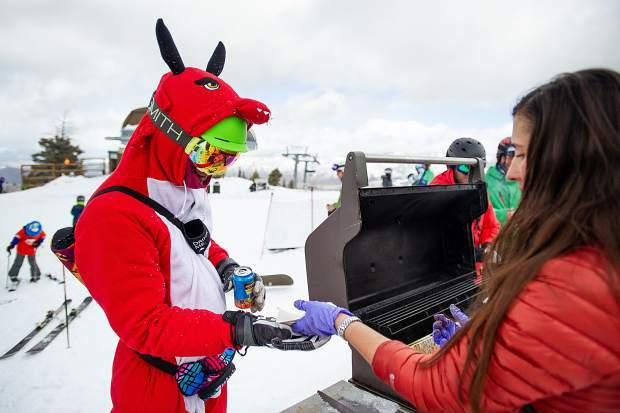 Although Highlands was already the wild child of the gang, Aspen Skiing Co.’s plan to demolish the base area bar the following day only fueled the level of debauchery that ensued. Aspen Highlands was independently owned until only a few years prior, and “It was a big moment” when Skico acquired what had long been considered “the locals’ mountain,” McCraw said. With its old-school-cool feel, the vibe and crowd at Highlands were different than at the other three mountains, he said. Highlands Café bar at the base, for instance, was “just a real locals’ dive, hang-out bar” – a place where ski patrollers, at the end of their shifts, would grease the surface of the bar with Crisco, strip down and slide across naked. On the legendary closing day of 1998, McCraw and his seven fellow bartenders sold beer to customers by the case. When thirsty patrons depleted the beer stock from the outside bar within the first hour of the party, more beer was transported to the base from the Merry-Go-Round restaurant via snowmobiles. All told, the Highlands Café party people polished off about 80 kegs and 200 cases of beer, by McCraw’s count. Of course, liquor also was flowing. Two drink “specials,” if you can even call them that, stand out in McCraw’s memory: The first, labeled a “Ship o’ Fool,” was a shot of Nassau Royale liqueur mixed with Admiral Nelson, or “knock-off Captain Morgan,” rum. The other odd refreshment simply combined the two beers that were on tap: A dark ale called Pete’s Wicked Winter Brew mixed with some good old-fashioned Coors. The shots sold for $2; pitchers of the beer blend cost $5. Each bartender walked away from that closing evening with $850 in cash, McCraw said. That equates to about $1,300 today. More than two decades later, locals still cut loose and can be equally boisterous as the season comes to a close. Aspen resident Ari Mizrahi, 39, will never forget his Highlands closing day of the 2015 season. “A few weeks earlier, some guys ducked a rope and triggered an avalanche that covered the entire skiers’ left side of the Highland Bowl and created gigantic debris piles at the base of the Bowl. During closing, people hauled in kegs and hid them inside the avalanche debris,” Mizrahi recalled. 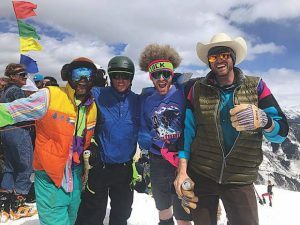 “So when we skied down, we climbed up and over the debris piles and into a full-on raging keg party with people on all sorts of substances and dressed in amazing costumes. What’s changed since the early days, however, is the sheer size and reach of the event. “The Highlands party has taken on a life of its own,” Skico spokesperson Jeff Hanle said. Whereas closing parties used to be predominately local, today people travel from all over to get in on the action. “Highlands closing has become a destination business driver,” Hanle said. “It’s one of — if not the — biggest days of the year at Highlands,” surpassing crowds on holidays such as Christmas. In recent years, more than 4,000 skiers and snowboarders have scanned their pass at Highlands on closing day, according to Hanle. 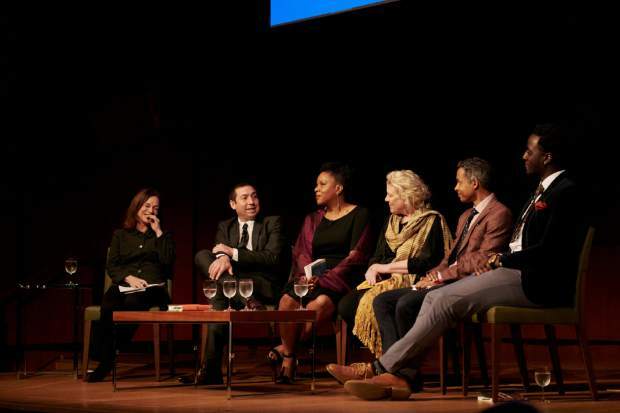 The total number of people celebrating is even greater, as Hanle noted another “recent phenomenon” of visitors who arrive solely to party without any ski equipment. Highlands sees scores of visitors from fellow ski resorts, like Steamboat and Vail, and other areas throughout the state and country, he said. Lorelei Strasburger, 26, of Denver, drove to Aspen for Highlands closing last April with a car full of Front Range friends and a few who flew in from Boston for the occasion. Strasburger called the event the highlight of her year, and fully expects to return this weekend for round two. 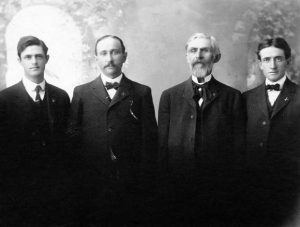 “It was so much fun,” Strasburger said. “The base of Highlands was just a riot. Just (with) all the festivities, you could feel there was an energy going through the town.